You’ve seen them on the curb. You’ve probably got a set in your garage covered in bugs, grime, the lawn furniture. They’re serving no purpose and you’d trash them were it not for the pile on top and the spiders underneath. I hear you. Toss them! Spend a couple hundred on a new set, right? Frankly, they’d be better used for the dog’s bed (of course, that’s not such a bad idea). 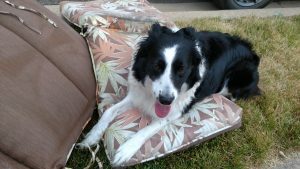 Don’t ditch those cushions! I know, DIY can be a lot of work. But in the end, it’s worth it. Glove up and brave the spiders. You can do this and the payoff is going to be huge! You’re doing a good thing. Each month, we offer a fabric at a deep discount. 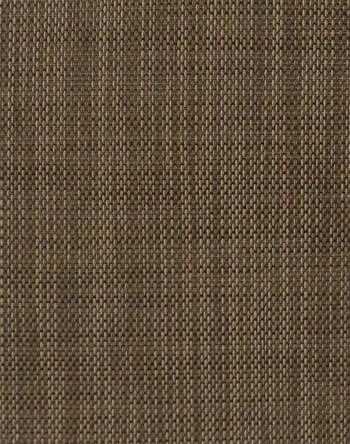 This month, we have Sunbrella Sling Augustine Pecan, an indoor-outdoor neutral-tone fabric that’s perfect for many uses, such as sling chairs, roller shades and other decorative window shades and umbrellas. Normally $14.98 a yard, this month it’s just $8.98 a yard. Order samples early, because this deal ends on the 31st! Check out our Christmas in July sale that’s going on now! Get free shipping on ANY order this month, plus extra savings of 10%-20% depending on sale amount. Shop now for great deals! Each month, we offer a fabric at a deep discount. For June, it’s this gorgeous, fresh floral called Sketchbook Peony Aqua by Kravet. Normally $12.98/yard, this pretty, 100% cotton fabric is just $6.98/yard for the month of June! Each month, we offer a gorgeous fabric at a deep discount. This month it’s Adele Spa, a cotton duck fabric. Order your samples early, because this special ends with the month of March! Each month we offer a gorgeous fabric at a deep discount. We start the new year off with this beautiful plaid silk dupioni called Simba Jewel. Normally $22.98 a yard, for January only it is just $12.98 a yard. Lovely for apparel, drapery, bedding, and other light home decorating projects. Don’t miss out on this awesome deal. Shop now! Are you taking part in our 12 Days of Discounts? If not, you could be missing out huge savings! You can take advantage of amazing discounts by combining price markdowns, volume discounts and the percentage off coupons. Note: Not all offers are available to wholesale customers, but wholesale customers should check our website regularly because we will allow them to use coupons at random times during the sale. December’s fabric special is Sparkle Burlap, which comes in five colors, all of which are perfect for the holidays. Think of all the things you could do with this fabric when it comes to Christmas? This amazing deal ends with the holidays – Dec. 31! November’s special is a great deal on our Christmas stocking kits! You choose the fabrics you want! Christmas stocking kit includes our stocking pattern, instructions and enough fabric and lining to make your own stocking. Pressed for time? For just a small fee, we will have your stocking cut and ready for you to sew. Want a custom stocking but don’t want to sew it yourself? We can do that for you for a fee! Use your imagination and come up with unique stockings your family will treasure for years to come! 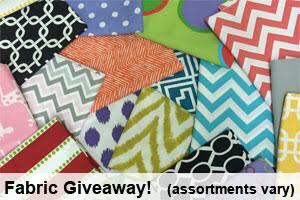 Our last regular giveaway: 8 lbs of fabric! So let’s get to our monthly giveaway for October! 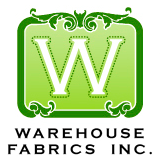 Enter to win an assortment of fabrics weighing 8 lbs from Warehouse Fabrics Inc. Simply comment at the bottom of this blog post using the entry requirements below. Our popular “Fabrics by the Pound” option allows you to get a sampling of a number of fun fabrics. All assortments will include a mixed variety ranging from 1/2 yard – 2 yards each. (Please visit link for more information!) You will get to choose from the fabric type options in the listing. Perfect for smaller projects! If you love our Premier Prints collection, choose “cotton drapery”! Note: you must put each entry in its own comment in order to get the separate entry points. The drawing is automated. Note 2: The first two entries are easy for anyone to answer. The rest are just extras. If you don’t have an account for whatever social media we are featuring this month, then you still get the first two options to enter. Part of what makes the Internet great is the ability to share and pass on. That’s why we have a social media option each time. 1. 1 entry – Find a product on our site that you love and share the link. What might you make with it? 2. 1 entry – Tell us what you’re sewing. Are you planning to sew gifts for the holidays? Make table linens for Thanksgiving? 3. 3 entries – Like us on Facebook and share a photo of something sewing-related on our timeline. It can be something you made or a home decor idea you love. You must leave three separate comments for this one so that they count as separate entries. Sorry! It’s an automated drawing and to get three entries, you must have three comments. 4. 2 entries – Share this on Twitter. Post the link here! Good luck, everyone! Contest ends Friday, Oct. 23, 2015, at 12:01 a.m. MDT. Each entry may only be completed once by each entrant. Winner has 48 hours to respond to email notification or new winner will be drawn. Winner’s first and last name and city/state will be provided by winner for use on our site.